Does it seem like very little is going your way? Do times in your calendar change or worse, disappear? Is your car breaking down? Your favorite shirt ripping? None of your words seem to be landing? Do very small situations suddenly have a lot of drama? Welcome to Mercury Retrograde, a quarterly event when our nearest planetary neighbor, Mercury, seems to move backwards in the night sky. Mercury isn’t really going backwards, its just in a part of its orbit where it doesn’t seem to be moving and the earth’s orbit and tilt gives it the illusion that it is doing the backstroke. When some people hear of Mercury Retrograde, they throw their hands up and go, “Well, the crapstorm is about to begin!” Its true in a lot of ways. The outside world starts to reflect the turbulence that is being brought from the depths of our souls to be seen and healed. It can seem like a very difficult time. But like in all storms, if you just go inside and hunker down and do some serious reflecting, Mercury Retrograde can be a gift to help make your year all the more smoother. Mercury Retrograde is a time to chill and go inward. Some of your oldest lessons are going to come up and say hello. Those feelings of emotional abandonment from Mom. Your greatest insecurities are going to come to the surface. Communication will go array. Travel may break down. This is not a time to make big purchases or sign contacts. Just dive into yourself and see when needs to be cleaned and worked on. The planet Mercury was named after the Roman god Mercury who was originally a Greek god named Hermes. Hermes was the messenger of the gods. He is a dimensional wanderer with a free pass to any realm on his winged shoes. He was diplomat to many realms and beings, from beggars, to kings, to supernatural half humans, half horses to Zeus, the most powerful of the gods. Hermes was also a loving trickster, making the lives of others somewhat difficult in order to show them their truest selves. He was also a healer and a bringer of magic. His magical staff, also known as the caduceus is the American medical emblem, two snakes entwining themselves around a winged staff. Part of Hermes’ job was to deliver messages as well as show the underlaying truth to those messages. When his planet, Mercury, comes by, think of it as a kind hearted trickster who might make things a little more difficult for a time in order to make the rest of your life easier. What is Hermes shaking up for you in this time? What messages are traveling across the dimensions to take to heart to transform, grow and change? 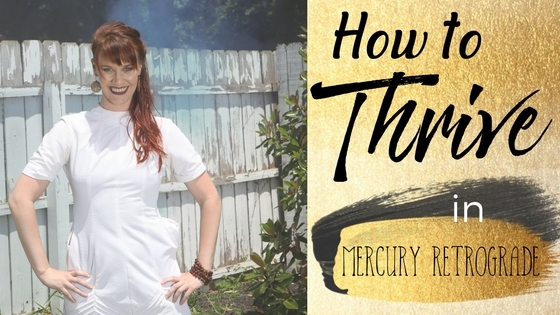 How to Thrive in Mercury Retrograde. Go Home. Stay at Home. Just as Hermes will so kindly deliver your next (or previous) soul lesson, you need to be in safe, comfortable environment to nurture this. Keep socializing down to a minimal because there is a good chance that you won’t get much quality time, but more of a entwining of what you and the other person are relearning to heal. Traveling is also not an ideal idea during Mercury Retrograde. Luggage may be lost. Planes may be missed. Cars may breakdown. Just hang out at home. That isn’t going anywhere! 2. Go inward. Journal, Paint, Follow your Right Brain’s need to create something. This is a time for the deep inward to be expressed outwardly. If you can for work, concentrate on working on the background of your job. More time on the computer less time on the phone if you can help it. If not, make a concerted effort to be as inward as possible when not around others, this way it will ease the your body’s need to play out old past patterns with other people and keep miscommunication to a minimum. 3. Have a chat with Hermes. What does Hermes have to teach you? Go into a meditation and ask him to help you. He may have delightful messages for you! If you need help here, feel free to listen to this meditation here. 4. Don’t take anything personally. Just remember and realize that things are going to get intense. It’s for the good. People around you are probably going to act out. You are probably going to act out, so just smile and nod and go for the ride. Learn what you can learn from the experience. 6. Have as much fun as possible! Also here is a meditation on Mercury Retrograde and asking Hermes to help you discover what you need to learn during this time of deep transformation. It’ll all be over soon!